Chapter XVIII. Man at Birth. * note: For the name of each degree of the spiritual mind and each of the natural, see Diagram XIII; this applies to all subsequent diagrams. “The soul which is from the father is the man himself and the body which is from the mother is not man in itself but from him and is only the clothing of the soul woven of such [materials].. are of the natural world. but the soul is of such [substances] as are in the spiritual world. Every 3 man after death lays aside the natural which he carried from his mother, and retains the spiritual which was from the father, together with a certain limbus [an envelop] of the purest [substances] of nature around it.”- TCR 103. “The soul is from the father and the body from the mother; for the soul is in the seed of the father and is clothed with a body in the mother; or, what is the same, all the spiritual [organism] man has is from the father and all the material [organism] he has, from the mother.” TCR 92. “There is a difference between what man receives from his father and what he receives from his mother. Man receives from his father all that is internal, his very soul or life is from the father; but he receives from his mother, all that is external. In a word, the interior man or the spirit is from the father but the exterior man or the body is from the mother.”-AC 1815. “Nothing is provided in the womb of the mother except a body conceived by and derived from the soul.”-TCR 167. 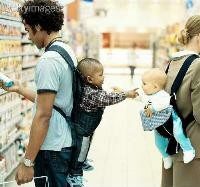 “Man is born spiritual as to his soul, and is clothed with a natural which makes his material body.”-TCR 583. “The soul of man that lives after death is his spirit and this is in perfect form a man.”-.DLW 394. “The mind of man is the man himself; for the first rudiments of the human form, or the human form itself with each and everything of it, is from the beginnings continued out of the brain through the nerves. This is the form into which man comes after death, and which is then called a spirit and an angel, and which is in all perfection a man, but spiritual: the material form, which is added and superinduced in the world, is not a human form from itself but from the former.” – DLW 388. “Since man is not life but a recipient of life it follows that the conception of man from his father is not a conception of life but only of’ the first and purest form receptive of life, to which as a stamen or beginning, substances and matters are successively added in the womb in forms adapted to the reception of life in their order and degree.” DLW 6. “All the evils which man derives from his parents, which are called hereditary evils, reside in his natural and sensual man but not in the spiritual.”-AE 543 [b]. The inmost A and the natural body E and F are the most developed at birth and are drawn large to indicate this. The spiritual mind B and the natural mind C are drawn small to indicate that at birth they are advanced but slightly beyond their rudimental state as at conception, requiring years for development to be effected by discrete degrees successively. The extremes which are the inmost and the natural body are at birth very large in comparison with the intermediates B and C.
By the inmost as an active and the natural body as a reactive all the intermediate degrees are formed out and stored with remains during childhood and thus are prepared for reformation and regeneration in after years. The spiritual body being derived from the natural mind and as it were one with it, is also tainted with evil from the father and is drawn in dark to indicate this. That the spiritual mind, the germ of which is from the father, is free from taint of evil and in heavenly form and order and that the natural mind, the germ of which is also from the father, is tainted since the fall, may be seen in Divine Love and Wisdom 432, and in Divine Wisdom (in AE ) III, 4. The two higher degrees of “the little brain, in the order and form of heaven” (DLW 432) constitute the spiritual mind and are equivalent to the three planes of that mind (B in this diagram), and are the two degrees of the spiritual mind B in the 2nd form, which illustrates the degrees of the mind as presented inDivine Love and Wisdom 432 and DivineWisdom (in AE ) III,4. These numbers describe the rudiments of the spiritual and natural minds; the inmost A is not mentioned in them though its presence is implied. The two interior degrees in the order and form of heaven are the two degrees B in the 2nd form. The exterior degree which was in opposition to the form of heaven is the natural mind C in the 2nd form, and is equivalent to the three degrees of C in the first form. The natural mind like the other parts is variously described in the Writings-in one degree, in two and in three, according to the purpose in different passages. 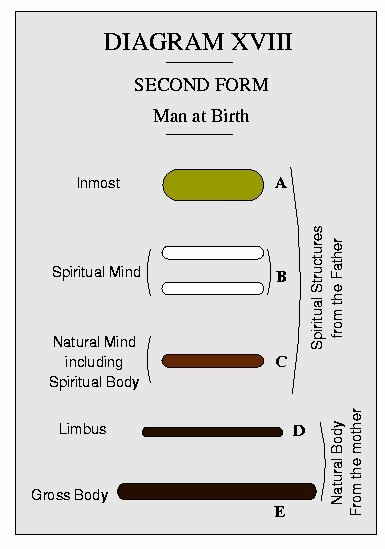 The inmost, the spiritual and the natural mind, and the spiritual body are formed of spiritual substances, as shown above, and in their strictly initial state as at conception are derived directly from the father, at which time the ultimate parts are more rudimental than the internal parts and especially more rudimental than the inmost or soul proper as this is the first form from which the others proceed. This diagram shows the development reached at birth, not the form of the initial at conception. We have in part shown the quality of the paternal faculties at the period of birth by their quality at conception. During growth in the womb no change occurs in their hereditary quality though they undergo an important development which as to the spiritual body is very great, but as to the mental faculties less. 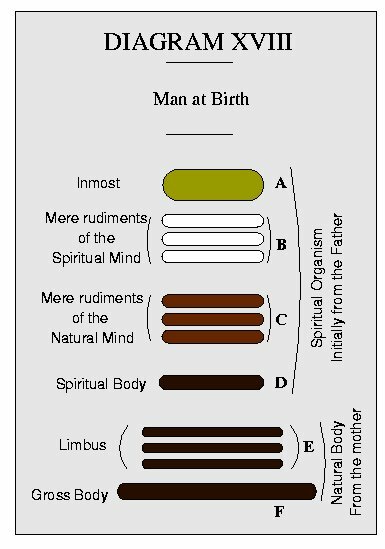 Whatever growth occurs in these paternal faculties A B C D from conception to birth must be from an incorporation of spiritual substances; growth from natural substances occurs only in the parts from the mother which are the limbus and the gross body. The evil from the mother inheres of course in the organism drawn directly from her, called in the whole the natural body. The inmost of this body consists of those purest substances of nature which compose the merest external of the natural mind (mentioned in DLW 257.) This is illustrated in Diagram XV at E. In this mental part from the mother the evil from her primarily inheres, tainting thence the gross body. This mental part is the limbus E E in this diagram. To indicate this taint of evil E and F are drawn in dark. We have already shown, -That the natural mind consists of spiritual substance and at the same time of natural substance,That from its spiritual substance arises thought but not from its natural substance,That the spiritual substance is initially from the father and the natural substance at birth from the mother,That the natural substance appertaining to the mind constitutes after death the cutaneous envelop of the spiritual body,That by such envelop the spiritual body subsists, that is, is preserved permanently in form because the natural is the containing element.And that in the part of the natural mind composed of natural substances (the limbus in this diagram) and not in any part of the mind composed of spiritual substances, the taint of maternal evil resides. To see that evil can inhere in these substances we must reflect that they are organized into a mental form constituting the merest external part of the natural mind conjoined to the spiritual part of it which spiritual part thinks and wills immediately within the natural, so that while this merest external is itself incapable of thought still it is the lowest and active seat of thought during life in the world. The thought is necessarily qualified by the state of this external, and is brought into act by the gross body. That evil does inhere in the part of the natural mind composed of natural substances (the maternal part) as well as in the part composed of spiritual substances, may be seen in Divine Love and Wisdom 270. This external is the seat of the external memory or memory of the body (AE 193[a]) both before and after death, though after death it is quiescent. This memory composed of material substances is usually called natural, exterior, or corporeal (as in HH 461; AC 2469-2494, and AE 569 [a], 832), but in Spiritual Diary 2752, it is called the outmost or material memory. When this memory quiesces after death, the internal memory formed of spiritual substances and appertaining to that part of the mind which is from the father comes into conscious activity. This external from the mother is the residence of all impressions and knowledge received through the senses whether gained by physical and sensible experience or by instruction in science, morals and religion, and also the residence of all conscious emotions arising from within. In this part only can man by introspection become conscious of his evils and falsities for here only can they be distinctly perceived. This is that ultimate or external in which man is together with the LORD and wherein he must directly cooperate with the LORD; the LORD alone working in the interiors. (DP 119, 120.) What lies further in is not perceptible except by outflow into this plane: only in this outer plane can be clearly seen the light of spiritual truth, and distinctly felt the warmth of celestial love. In this external part of the natural mind every maternal inclination whether evil or good has its primal abode. Here too reside all mental bias, faculty, disposition and ability, from the mother. These however are subject to more or less modification and even practical nullification from the various conditions of the gross body. According to the above order the spirit of the child first forms those purest substances of nature from the mother into the enveloping part or limbus of the natural mind, that it may use that covering as the lowest seat of its thought and the medium by which it may flow into the gross body; and it also forms this body of grosser and grossest substances of nature and places therein the five senses as organs for sensing the outer world, acquiring knowledge and expressing its own feeling and thought. Although the soul of the child measurably imparts its own quality to that natural external it does not remove the quality of the mother. (TCR 103; AC 6716. We said the quality of the father is imparted to the body of the child chiefly by the child’s own soul, but the quality of the father is communicated to the body of the child by being first appropriated by the mother and by her transmitted to the child in the substances and forms furnished by her. In some cases (and there will be more as the Church advances) the father’s likeness flows in each globule of the mother’s nervous fluid and his image in every drop of her blood. Something of this exists in most instances if not in all. (Marriage page 9, item 22; Latin Edition, p 7. AE 1004.) Still whatever of paternal quality thus reaches the child’s body is first materialised and imparted as the mother’s also. Conversely, the father may appropriate the sphere of the mother and impart it as his own to the spirit of the child and thence to its body. In regard to the maternal rational (called the first rational and represented by Ishmael) it should be recollected that this rational is formed by truths obscured by appearances which appearances are to be dispersed during regeneration; this is the rejection of the maternal rational. From Arcana Coelestia AC 2654, 3207, 2557, we see that this rational is called maternal only because it is mediately, not directly, from the mother. I. The maternal part of the natural mind is the seat of all the mental states inherited from the mother and is the seat of the natural memory (AE 193), and during life is the active seat of all the degrees derived from the father. Although this maternal part of the natural mind becomes quiescent after death it still servestwo great and indispensable uses to eternity. (1) It is an envelop of the spirit holding its structure in form and its state entire, thus preventing its disintegration through the volatility of its spiritual substances. (2) It preserves the state of man after death as determined by his ruling end, changeless to eternity, securing to the enduring heaven and preventing the evil from sinking good an ever into deeper hells. II. Without the natural furnished by the mother there could be no propagation of the human race, thus no heaven of angels which is the Divine end of creation. III. Although the spiritual faculties are not from the mother, they must for regeneration acquire an external, from various knowledges and truths, to embody themselves; and these are obtainable only by means of the natural from the mother. Previous: Chapter XVII. All the Degrees in Trines. Up: Discrete Degrees Next: Supplement. 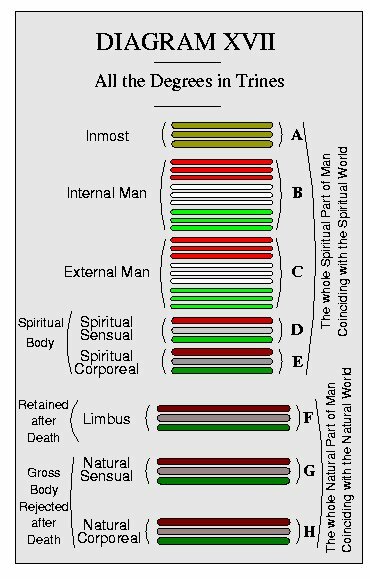 THIS diagram illustrates the limbus surrounding the whole spirit of man after death and serving as a cutaneous envelop to hold the spirit securely in form to eternity. F is the gross material body now rejected, the spirit being separated from it and risen into conscious life in the spiritual world. The natural or external memory of man in the world is seated in the limbus the extreme ultimate of the natural mind. This memory consisting of the states impressed upon the limbus during life in the world, remains after death but is quiescent. If this diagram be taken to represent the whole angelic heaven, E is their aggregate limbus. Extending the view, E represents the limbus of the spirits of this earth and all earths in the universe regenerate or unregenerate. Previous: Chapter XV. The Limbus. Up: Discrete Degrees Next: Chapter XVII. All the Degrees in Trines. The degrees A B C and D combined, represent the whole of the spiritual part of man, that is, all which is composed of spiritual substances (TCR 103, DLW 388), A representing the supreme degree or soul-proper; B the internal or spiritual mind with all its degrees; C the external or natural mind with its degrees; and D the spiritual body, consisting of the spiritual sensual and spiritual corporeal as shown in Diagram XIII. The Limbus E and gross body F together constitute the entire natural or material body; the limbus being nearer to the spirit and invisible to the natural eye, the gross body more external and rejected at death. E is drawn in green to distinguish it from the spiritual structures above, F consisting of gross natural substances is drawn in dark. “The natural mind of man consists of spiritual substances and at the same time of natural substances; from its spiritual substances, thought is produced but not from its natural substances; these [natural] substances recede, [or pass from activity to quiescence] when man dies but not the spiritual substances, wherefore that same natural mind after death when man becomes a spirit or an angel, remains in a form similar to that in which it was in the world. The natural substances of this mind, which as was said recede by death, make the cutaneous envelop of the spiritual body in which spirits and angels are. By such envelop, which is taken from the natural world, their spiritual bodies [permanently] subsist, for the natural is the [fixed] containing ultimate.”- DLW 257. “The material form [or natural body of man] which is added and superinduced [upon his spirit] in the world, is not a human form of itself, but from the human form of the spirit, added to and superinduced [upon the spirit] that man may do uses in the natural world, and also that he may carry with him [after death] from the purer substances of the world, something fixed containing his spirituals, and so continue and perpetuate life.”- DLW 388. “Man by death puts off the grosser [substances] of nature and retains the purer which latter are next to his spiritual, and these are then his containants.”-DP 220. Inasmuch as the bodies of men rest on the earth, and spirits and angels through the limbus rest on men, it follows that angels and spirits rest mediately upon the earth itself as the last foundation. (LJ 9.) 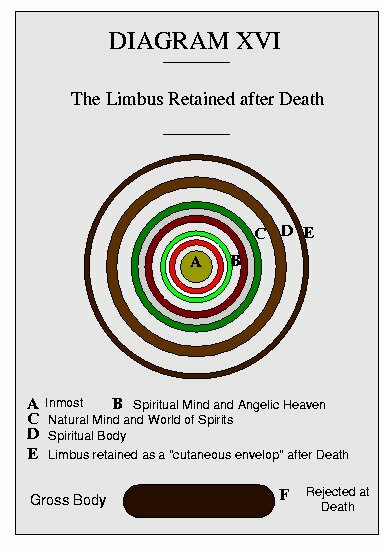 Angels and spirits rest on men by means of their limbus because the natural substances composing the limbus are joined with the lowest spiritual substances and are in a sense intermediate between the spiritual and the grosser and palpable natural organisms of men. The limbus must be kept in form by connection with natural substances coarser and firmer than itself in graded structures even down to earthly solids. When we say the limbus is composed of the purest substances of nature we mean the purest of the human body; the substances of the natural sun and others proximately emanating therefrom are doubtless prior to these. “The angelic mind cannot be procreated, and through procreation be multiplied except in man. “He who knows the quality of substances in the spiritual world, and the quality respectively of matters in the natural world, can easily see that there is no procreation of angelic minds nor can be, except in those and from those who inhabit the ultimate work of creation, the earth. But because the quality of substances in the spiritual world in relation to matters in the natural world is unknown [it shall now be told]. Substances in the spiritual world appear as if they were material, but they are not; and because they are not material therefore they are not constant. They are correspondences of the affections of the angels, and with the affections or the angels they are permanent, and with them they are separated [that is, on the cessation of the affections, the substances composing the object are dispersed, and the Object vanishes, see D. L. W. 344; TCR 78]. Similar would it have been with the angels, had they been created there. But besides, there is not, nor can be, with the angels any procreation and thence multiplication other than a spiritual one, which is that of wisdom and of love, such as is also of the souls of men who are generated anew or regenerated. But in the natural world there are matters, by which and from which procreations and afterwards formations can take place, thus multiplication of men and thence of angels. “Spirits and angels hence derive substance and life to eternity. “The reason is that every angel and spirit from having been first born a man in the world derives substance, for he retains with himself from the inmost [substances] of nature a medium between the spiritual and the natural by which he is finited [that is, definitely terminated and fixed in form] so that he may subsist and be permanent; by this medium he has something related to the things which are in nature and also correspondent to them. “By this also spirits and angels can be adjoined, and conjoined to the human race, for there is conjunction and where there is conjunction there must be a medium. “The natural and temporal are the outmosts and ultimates into which man first enters, which he does at birth in order that he may afterwards be introduced into things interior and superior; for outermosts and ultimates are containants, and these are in the natural world. This is why no angel or spirit was created immediately, but why all were first born men and so introduced [into things interior or superior]; hence they have the outermosts and ultimates which in themselves are fixed and established, within which and by which interiors can be held together in connection. But man first puts on the grosser [substances] of nature; his body is from them but by death he puts them off, and retains the purer [substances] of nature which are nearest to spiritual [substances] and these then are his containants. Furthermore in outermosts or ultimates, all things interior or superior are together; wherefore every operation of the LORD is from firsts and ultimates together, thus in fullness. But as the outermosts and ultimates of nature cannot receive the spiritual and eternal things to which the human mind is formed, as these are in themselves, and yet man was born to become spiritual and live forever, therefore man puts off the ultimates, and retains only the natural interiors which meet and accord with the spirituals and celestials and subserve them as containants. This is done by the rejection of temporal and natural ultimates, which is the death of the body.”-.DP 220. In the above we have the reason of the universal order of creation-the finer in the grosser, the active in the inert, the first in the last, the spiritual in the natural. This difference of substances is necessary, for were there no active, fluid, evanescent substances there would be no life, force, or motion; and were there no solid, inert substances there would he no stability and duration of form. Because substances in the spiritual world are evanscent and matters in our world are stable and constant especially in ultimates, the whole spiritual universe acquires organic permanence solely by the natural universe clothing and sustaining it. Inasmuch as the human spirit in its rudimental form as an offshoot from the soul of the father is an organism of spiritual substances evanescent in their nature (DLW 432; TCR 103; CL 220), it must (when begotten) be immediately fixed by taking on the primordial rudimentary form of the material body from the purest elements of nature supplied for the purpose by the mother, thus securing permanence and subsequent growth. Man does not at death cast off the whole of his material form but only the gross mass and retains the purest part which was nearest his spirit, as a limbus or cutaneous envelop to hold his spirit in endless duration, and as a medium conjoining him with man in the world, thus preserving both; spirits and angels resting on men and men receiving influx from them. Hence man at death, when he becomes a spirit, is not utterly separated from the material world since he does not reject ALL he has taken on from this world but remains (to the extent of his limbus) unconsciously connected with it: all this is to secure the Divine end of creation, an ever increasing and ever enduring heaven of human beings. “They who die adult have and carry with them a plane acquired from the earthly and material world. This plane is their [external or natural] memory, and its bodily, natural affection. This remains fixed, and is then quiescent; but still it serves their thought after death as an ultimate plane, for the thought flows into it. Hence such as that plane is and such as is the correspondence of the rational with the contents of that plane such is the man after death. But those who died infants and were educated in heaven have not such a plane, but a spiritual natural plane: because they derive nothing from the material world and the earthly body they cannot be in so gross affections and hence thoughts; for they derive all from heaven.”- HH 345. We must not infer from the above that those who die in infancy retain no limbus from nature to preserve their spiritual organism. The meaning is they have not a merely natural memory, that is a memory formed in the plane of the limbus by the use of the natural senses as those have who grow up in this life. But while growing up in the other life, their memory is formed in a spiritual structure just within the plane of the spiritual senses and is called spiritual natural because it is in a spiritual plane resting upon the natural. Should their limbus he insufficient for adult stature, it will necessarily be increased as they advance. 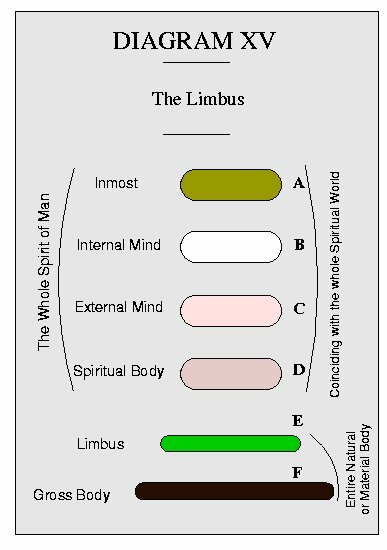 As all living organisms undergo change by a resolution and passing off of their substances and renewal by appropriation of new substances, so must it be with the limbus. We must not suppose that the limbus is taken into the spiritual world. It is natural and must remain in the natural world. Man as to his spirit being of the spiritual world even from birth and unconsciously an inhabitant there during life in the body, does not go into that world at death but merely awakens to manifest presence there by the opening of his spiritual senses. This is because the spiritual and the natural worlds are not separated by distance but are together and conjoined like soul and body. How can spirits move from place to place in the spiritual world while clothed with a cutaneous envelop of natural substances? Change of locality in that world is effected by change of state. Swedenborg so traveled there as to his spirit while clothed with the gross body even. (See E.U. 127, HH 192, 195.) A fuller answer to this question is given at the end of Chapter XXIII. The mental functions of the Limbus will be presented in Chapters XVIII to XXIV. 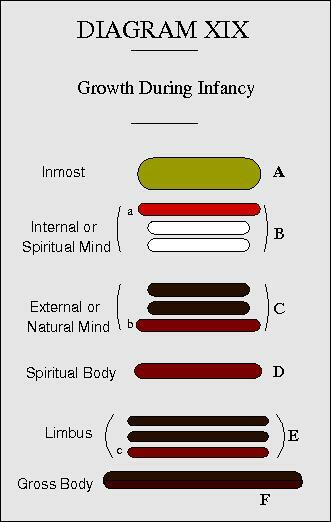 THIS diagram presents the subdivisions of each degree of the spiritual mind into three and of each heaven into three. Each degree of the natural mind also has three planes to be presented in Diagram XVII. “In order that anything may be perfect, it must be distinguished into three degrees; so is heaven, and so are the goods and truths there; that there are three heavens is known, consequently three degrees of good and truths there. Each heaven is also distinguished into three degrees, for its inmost must also communicate immediately with the superior, its external with the inferior, and the middle thus, by means of the inmost and the external, with both; hence is its perfection. The case is similar with the interiors of man which in general are distinguished into three degrees, namely, into the celestial, the spiritual and the natural, in like manner each of these into its three degrees, for man who is in the good of faith and of love to the LORD, is a heaven in the least form, corresponding to the greatest. So it is with all things of nature.”-AC 9825. “There are three heavens, and each heaven is distinguished into three degrees, and likewise the angels who are in them; wherefore in each heaven there are superior, middle, and inferior angels.”- AE 342[a]. To understand the general division of the whole heaven into two kingdoms, celestial and spiritual, and the existence of the two principles, celestial and spiritual, in each kingdom, and even in each angel, it must be borne in mind that the celestial of one heaven, kingdom or angel, differs from the celestial of another and that the spiritual of one differs from the spiritual of another. See “Relation of the Three Heavens and the Two Kingdoms,” page 37, also the two distinctions between the celestial and the spiritual, page 86. 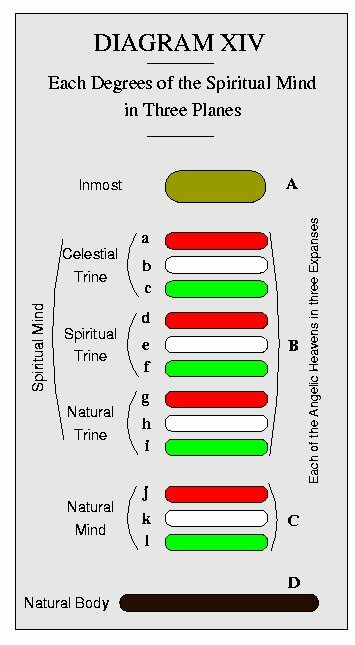 The three degrees of the natural mind C are drawn in red, white and green-j representing the natural will, k the natural understanding and l a combination of the two in ultimates, thus the celestial, spiritual and natural of the external mind. The view of the degrees of the natural mind, here presented, is different from that in Diagram XIII; hence the reverse order of Colour. Below the natural or external mind C is drawn the spiritual body D, consisting of the spiritual-sensual and spiritual-corporeal g and h. These are called the spiritual sensual and corporeal in distinction to the natural sensual and corporeal organized of material substances. The sensual degree of the external mind f just above the spiritual-sensual, is the lowest degree of that mind and closely adheres to the spiritual body D.
The celestial degree a is drawn in red because red corresponds to love or the will, the dominant characteristic of this degree, and because red is the distinguishing Colour of the celestial heaven. The spiritual degree b characterized by what is intellectual, is drawn in white because white corresponds to truth, the dominant characteristic of this degree, and white is a distinguishing Colour of the spiritual heaven. 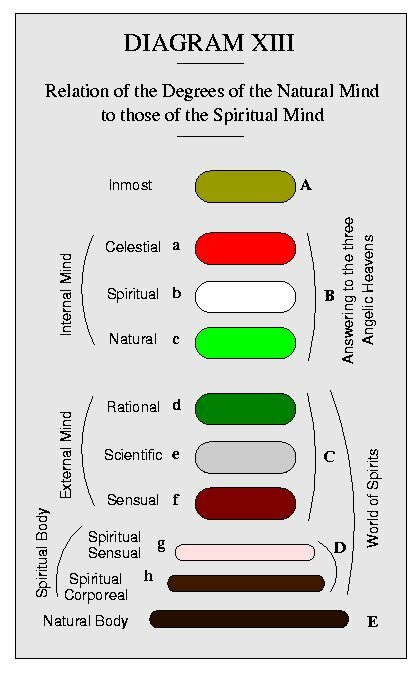 The natural degree c is drawn in green because green corresponds to the ultimates of celestial love and spiritual truth in the lowest plane of the internal mind, and green is the distinguishing Colour of the natural heaven which is the lowest heaven. The celestial a passes indeed centrally through d and e in the natural mind to reach its appropriate f, as it had passed through b and c in the spiritual mind, and is the essential principle in them all, that is in b c d e; a being first and therefore universal must go to the last where it binds and preserves all. This descent of a is illustrated by the descent of nerves from the brain through intermediates into the skin whence they return again to the brain, binding and preserving all things of the body. The spiritual sensual and corporeal are composed of spiritual substances and are the lowest seat of the paternal proprium. The natural body E being material is drawn in dark in contrast with the planes above. Each integral part, namely, the spiritual-corporeal, the spiritual-sensual, each degree of the natural mind, and each of the spiritual is in itself a lesser human because the whole man is composed of parts which are images of the whole. This may be illustrated by the natural body, in which are several systems combined; for each system, the nervous, the sanguineous, the osseous, the muscular, the cutaneous, is, in a sense, a human system, and so a human in a lesser form. Thus man in spirit as in body is composed of many humans one above or within another from the foot of “Jacob’s ladder” to the top, that mystic ladder being the whole human and each step in it a lesser human. This diagram is a key to many passages. “The human mind from which and according to which man is man, is formed into three regions, according to three degrees; in the first degree it is celestial, in which also are the angels of the highest heaven; in the second degree it is spiritual, in which also are the angels of the middle heaven; and in the third degree it is natural, in which also are the angels of the lowest heaven. The human mind, organized according to these three degrees, is a receptacle of Divine influx; but still the Divine flows in no farther than man prepares the way, or opens the door; if he does this even to the highest or celestial degree, then man becomes truly an image of God, and after death he becomes an angel of the highest heaven; but if he prepares the way, or opens the door, only to the middle or spiritual degree, then indeed, man becomes an image of God, but not in that perfection, and after death he becomes an angel of the middle heaven ; but if he prepares the way, or opens the door, only to the lowest or natural degree, then man, if he acknowledges God and worships Him with actual piety, becomes an image of God in the lowest degree, and after death he becomes an angel of the lowest heaven. But if he does not acknowledge God and does not worship Him with actual piety, he puts off the image of God, and becomes like some animal, except that he enjoys the faculty of understanding and thence of speech. If he then closes up the highest natural degree, which corresponds to the highest celestial, he becomes as to love, like a beast of the earth; but if he closes the middle natural degree which corresponds to the middle spiritual, he becomes as to love like a fox, and as to sight of the understanding like a bird of the evening; but if he also closes the lowest natural degree as to its spiritual, he becomes as to love like a wild beast, and as to the understanding of truth like a fish”-TCR 34. The human mind from which and according to which man is man,” in this passage obviously means the actual mind which in itself is human, in distinction from the natural mind below, which is humanized only from the spiritual. The first or celestial degree, mentioned in the same passage, is a the highest plane of the internal mind, the second or spiritual is b, the third or natural, c. “The beast of the earth” is in d, “the fox” in e and “the wild beast” in f.
Upon first reading, this number may seem obscure, owing to the omission of a distinct statement that there are three degrees in the natural mind, below the three degrees of the spiritual mind. The highest natural, the middle natural and the ultimate natural in the passage, are represented by d e and f.
The order of the opening of the three degrees of the internal mind during regeneration, will be presented in Diagrams XXII, XXIII and XXIV. The closed state of the degrees of the natural mind, in the case of the wicked, will be presented in Diagram XXV. The spiritual mind, here drawn in three degrees is the same that is drawn in two degrees in Diagram XII. When this mind is drawn in two degrees, the lowest c in this diagram is included in the two; as will appear more plainly in what follows.